There is a wide range of quality and budget accommodation in the Yarram and Port Albert district, including quality bed and breakfast units, self-contained cabins, motels and hotels. Long term accommodation is also available. This is a free listing. Underlined listings may be linked directly for your convenience. This is NOT a comprehensive list. Seek further informatrion on the internet. IMPORTANT: Do not take prices mentioned as gospel; they may well be out of date. Contact the establishment. See also YARRAM TRADERS AND TOURISM WEBSITE. Water views from the front deck. Only a short walk to the water, general store, hotel and restaurant. Ideal for holiday living. This well appointed 3 bedroom modern home has a large open living area for family holiday enjoyment. Electric cooking. Reverse cycle air conditioner. Three bedrooms with three queen size beds. TV with DVD and VHS player. David Foat. Licensed Estate Agent. 234 Commercial Road, Yarram. 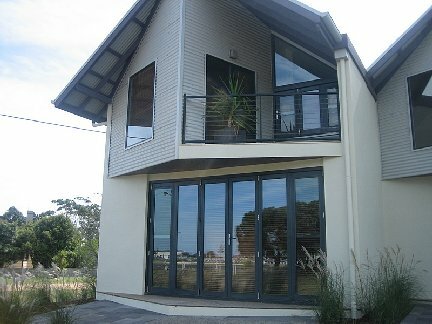 New luxury architecturally designed two storey town house. Rustic simple forms reminiscent or coastal boat storage sheds or beach bathing pavilions, but with a twist: the finishes and fitouts are modern and elegant with up to the minute fixtures. This is a two storied townhouse with 2 bedrooms upstairs. The ground floor is provided with living dining kitchen spaces as well as a laundry and bathroom. The outdoor living court has a generous undercroft with outside sink for fish cleaning. The living area has a wall of bifold doors opening out onto a narrow terrace facing the sea view. The upper floor contains the master bedroom with generous ensuite and spa, opening out onto a private deck. The remaining bed space is a singular large bedroom. Fixtures and finishes - kitchen fitting by Meile with glass splashbacks to kitchen benches. Spa bath WC’s and basins by Hoesch Design. Stairs are polished solid timber flooring over concrete slab. Upstair floor is carpeted in coir matting. The ceiling upstairs is raked and lined with battened Balinese rattan. 1 Queen and 2 single beds upstairs and 2 trundle beds downstairs. Sleeps 6. Tarrif - $1,500.00 per week - peak season. $250.00 per night minimum of 2 night stay. Situated 200 m from the boat ramp, picnic area and car park and a short stroll to the hotel and wharf area. Close to the local shop which has bait, ice and fuel and other supplies. This holiday house is fully equipped to sleep 7, with 2 double beds 1 single and a fold out divan. Full kitchen with microwave, automatic washing machine, reverse cycle air conditioning, tv. BYO linen. Rates - $750 per week (off peak) $150.00 per night min 3 night stay. AAA Five star rated luxury accommodatiion. All suites have been superbly appointed offering features including king size beds, spa baths, private balconies and views to either Port Albert or Wilsons Promontory. Choose the suite that best captures your mood. privacy and a very comfortable and unique living experience. This serene holiday retreat sleeps 6 people with 2 queen beds and 2 single beds. There is a BBQ and outdoor furniture for you to enjoy your holiday break. Special Rates - $150.00 per night if you book for 4 nights or more. Christmas, Easter, school holidays min 4 nights stay. BYO linen, or linen can be supplied at a cost of $25.00 per set. 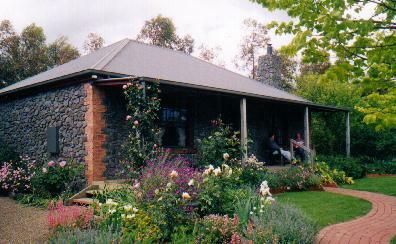 Self-contained two bedroom Bluestone Cottage. Serenity, wood fire and spa in garden setting. Yesterday's charm with today's comforts. RACV rated **** four stars. Hiho's Lane, Yarram, Vic 3971. The Rosebank Tourist Park is the closest tourist park to town and the ideal ccommodation base for you to enjoy the myriad sights and delights the area has to offer. We cater for many different types of holiday stays. There are ensuite and drive-through facilities for caravans and motor homes, shady campsites for tents and camper trailers and a range of accommodation cabins and units. The large amenities block also contains a camp kitchen and a book exchange. Your hosts: Bas & Joan de Bondt. Phone (03) 5182 5063. Location: 375 Commercial Rd., Yarram, Vic 3971. Set in countryside only 1km from the heart of Yarram, the Ship Inn Motel and Function Centre is an ideal choice for a weekend getaway for two, or a corporate business meeting for 100. The motel features 26 air-conditioned rooms, an in-ground heated pool and beautiful countryside views. 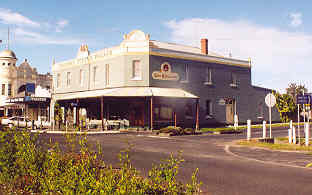 The Function Centre has a capacity for up to 150 guests, with a licensed bar and entertainment area. Also a complete kitchen capable of providing catering services is available on request. Your friendly hosts: Geoff and Barb Govers. 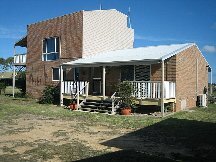 480 Commercial Road Yarram, Vic 3971. 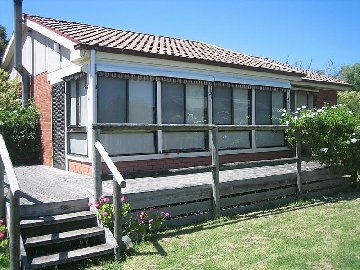 One of the grand old buildings in Yarram has several flats, and self-contained rooms available for longer term accommodation for Yarram residents. (Please note - this is not for holiday/weekend accommodation). A delightful bed and brakfst country retreat within easy reach of the coast and the hills, located within twenty minutes of the Yarram township in beautiful South Gippsland. Two self-contained cottages in tranquil surrondings, with superb views. Your hosts: Graeme and Dianne Peacock. Location: 17km from Yarram, on Bowdens Road, Won Wron. 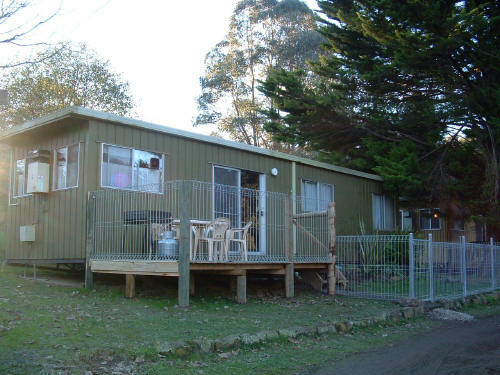 Two room farm-style accommodation, new unit, at Macks Creek, ten minutes from Yarram. RMB 7727 Tarra Valley Road, Tarra Valley, Yarram, Victoria, Australia 3971. 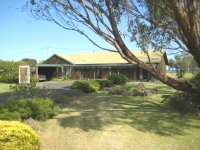 Nangeela Caravan Park and Tourist Flats, Tarra Valley - now operating under new management as Best Rriend Holiday Retreat - see above. 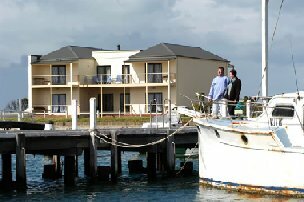 Port Albert Holiday Homes, (03) 5183 2677. Fully self-contained units.